Not always.. but most of the times i am lazy!😌. But never lazy to munch. 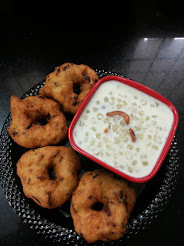 imagine.. one lazy evening.. someone serving you.. nice hot and crunchy home made onion bajjis with two spoons of coconut chutney beside the bajjis. 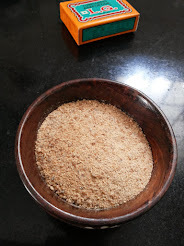 சுடச் சுடச் வெங்காய பஜ்ஜியும் தேங்காய் சட்டினியும்.. hmm.. wake up! Most of the time it is the lazy people around the world who has invented many innovative and easy hacks. It was one such lazy day I had a craving for such snacks. then.. I became more innovative.. thinking how to make a easy snack.. good to eat like those which we grew up eating.. something hot and deep fried.. yes you heard me.. "deep fried".. because once in a while, the maleficent 😈 in us.. has to be fed.. after all, it IS a part of us. 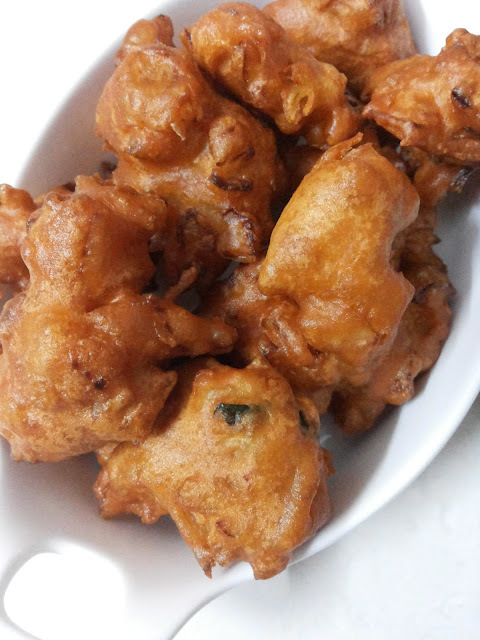 I like onion bajji. But when i have to cut the onions into roundels, I could cut only few roundels.. the rest all were falling apart. And i will have to save them and in the end, make sort-of tiny balls with the left over bajji batter. 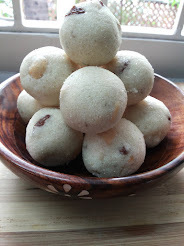 So, I thought why not I straight away make the bite size bajjis with chopped onions. that's it. 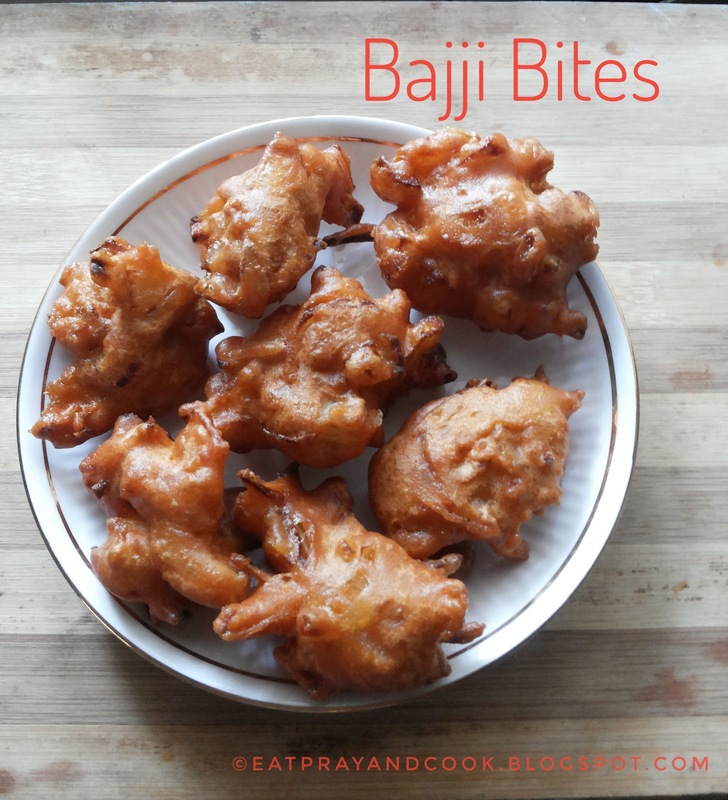 I got these bajji bites. But God promise.. I have compromised the feel and taste of bajji made with onion slices. But its okay when you are really lazy and it is you who have to drag your body to the kitchen and cook some snack for yourself. I can hear some of you saying "then why don't you just eat some fried gram or rice puffs or few nuts etc instead". But what to do i am a foodie.. sometimes lazy foodie.. Okay now seriously.. to the bajji bites. 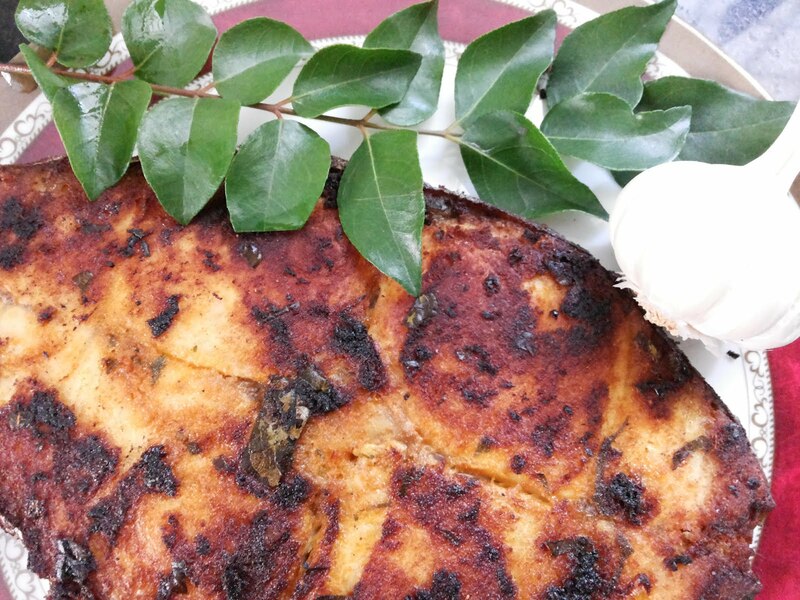 Take some oil in a kadai and keep it on stove ready for deep frying the bajji. 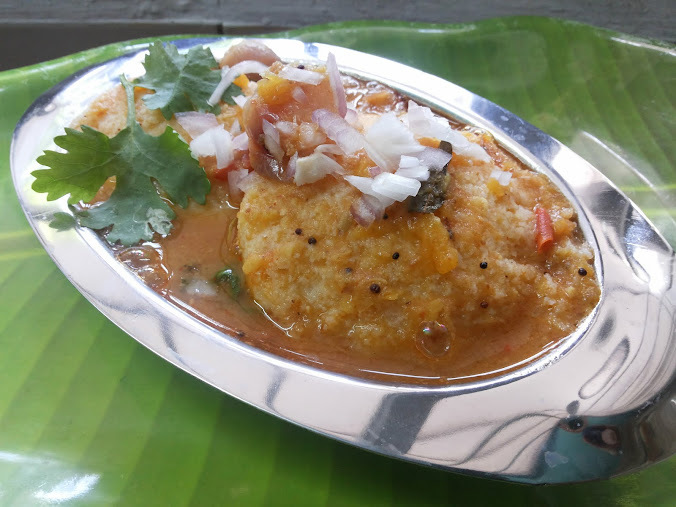 Take another bowl and add rice flour, corn flour, salt and asafoetida to the gram flour and mix. 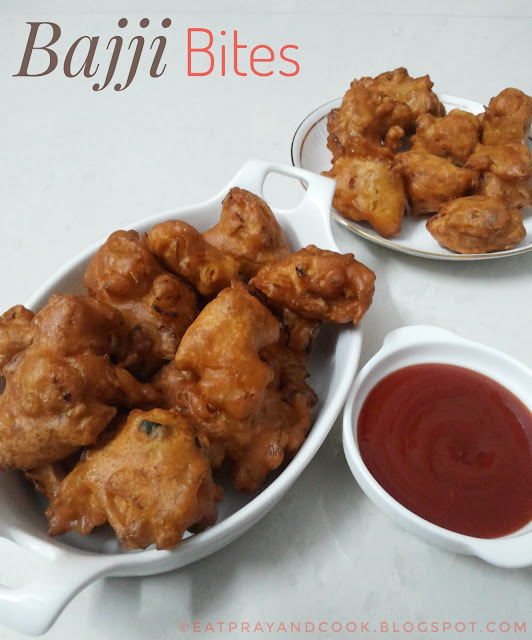 Now add water and mix it up till you get a bajji-batter consistency batter. 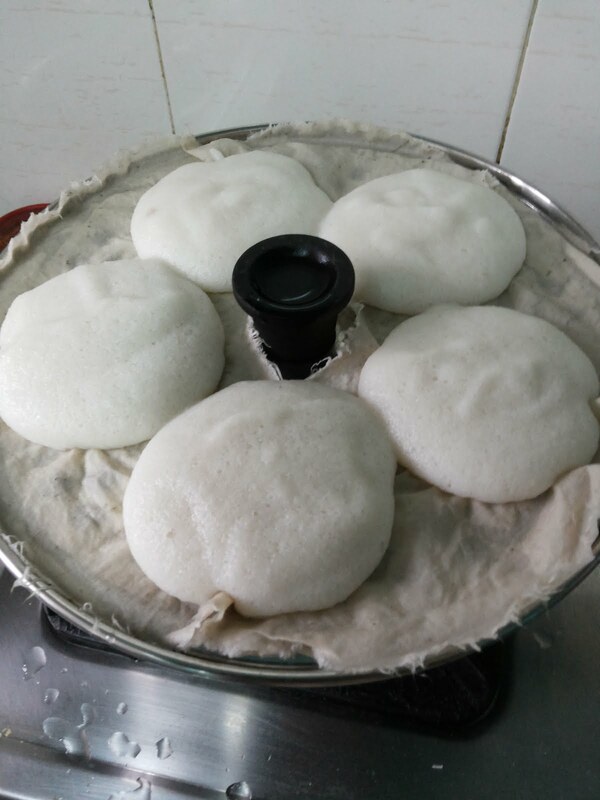 it should be thicker than the idli batter. but not as thick as medu vadai batter. Leave it aside and get ready with the onion and other ingredients. Add them to this batter. mix well. Add more onion if you find the onion is less. I would prefer more onions in my bajji bites. In the mean while the oil should be hot. Take the batter in spoon and drop it in oil carefully little by little. you can drop the batter by pinching little by little with your hand too. Let it fry till it is beautifully dark orange colour bajji. Remove them from oil and transfer it on a kitchen tissue. The cute, crispy bite-size bajji bites ready to be served. 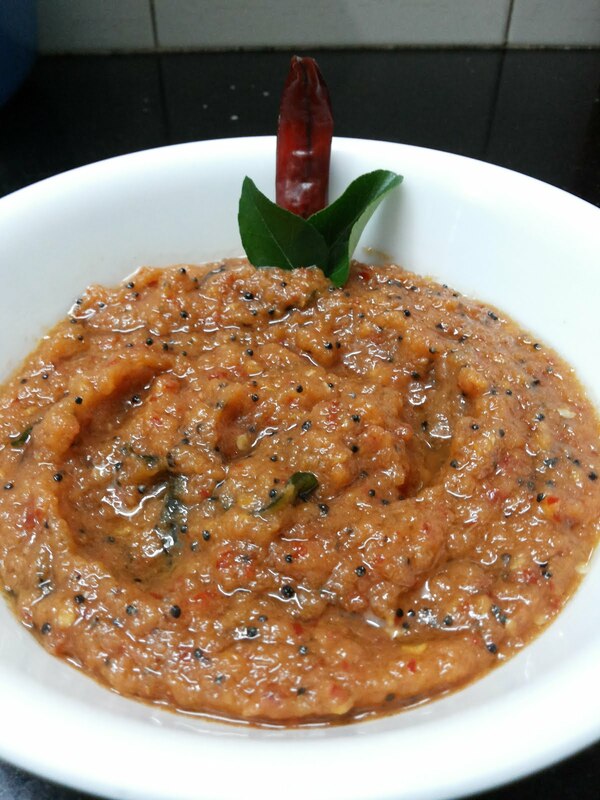 As i said.. since i was lazy.. i served it with tomato ketchup and not coconut chutney. In the beginning when I said I felt like eating something.. my beloved ones were lending their deaf ears busily doing their work. I had to move to the kitchen all alone doing all this work to make this lazy snack.. now.. the same house.. same people.. don't know where they were so long.. all came and rounded up my bajji-bites plate. my husband would say "hey wow.. what's this... smells like bajji.." and my daughter would come "amma.. what is this amma? did you add onion in it?" Curious to know whether I added anything else in it which she doesn't like. The only help they did was, they bought the ketchup bottle from the kitchen to the eating place. Now, that's okay as they are also part of US. We said "cheers" and gobbled the bajji bites. One of my favourite. 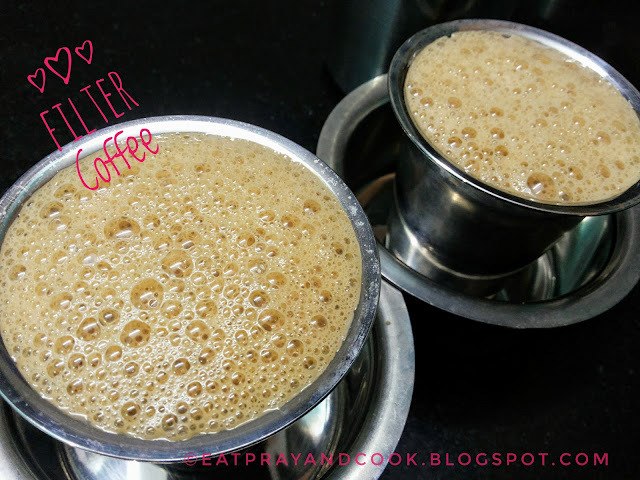 . .
Filter Coffee - Love for "Filter Kaapi".. Check out some more Delicacies. . .
Gala-gala (Kalakala) - Gala Time Snack ! 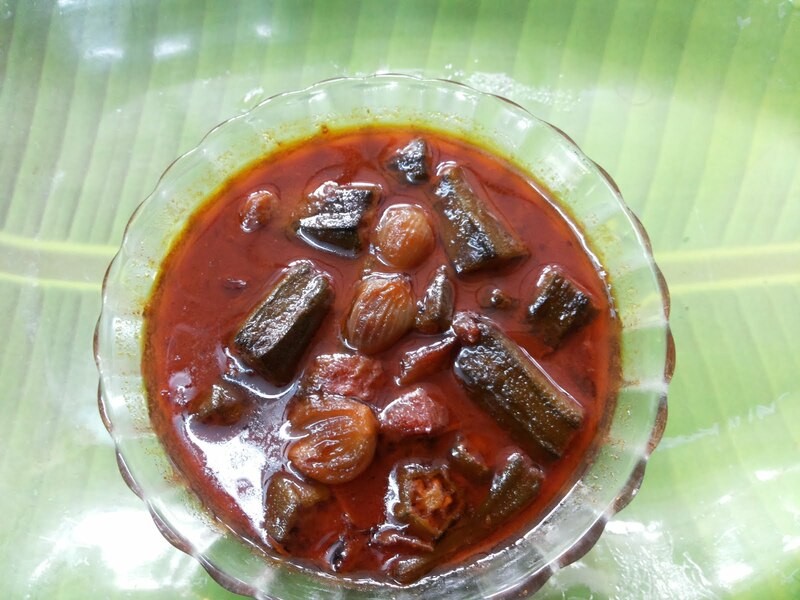 Welcome to my blog Eat Pray and Cook. 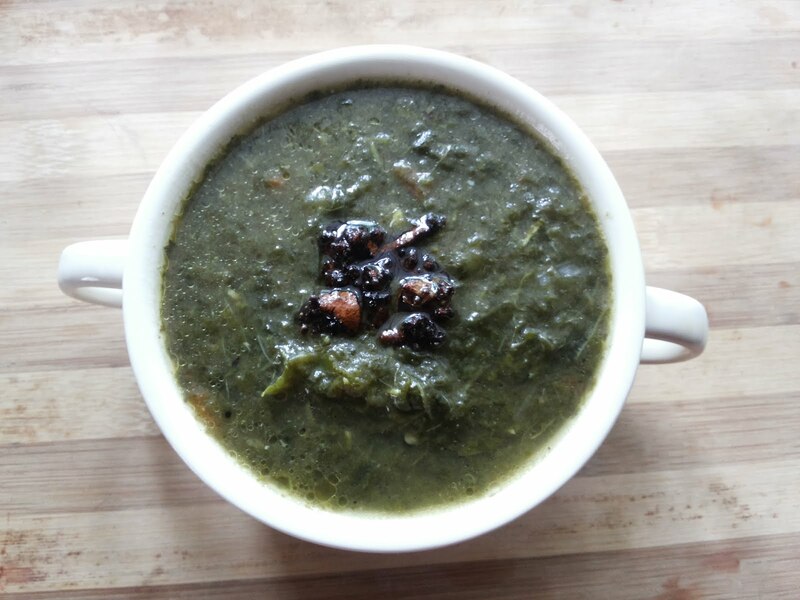 I am Dhivya, a happy homemaker, optimist, nature lover, and a foodie! 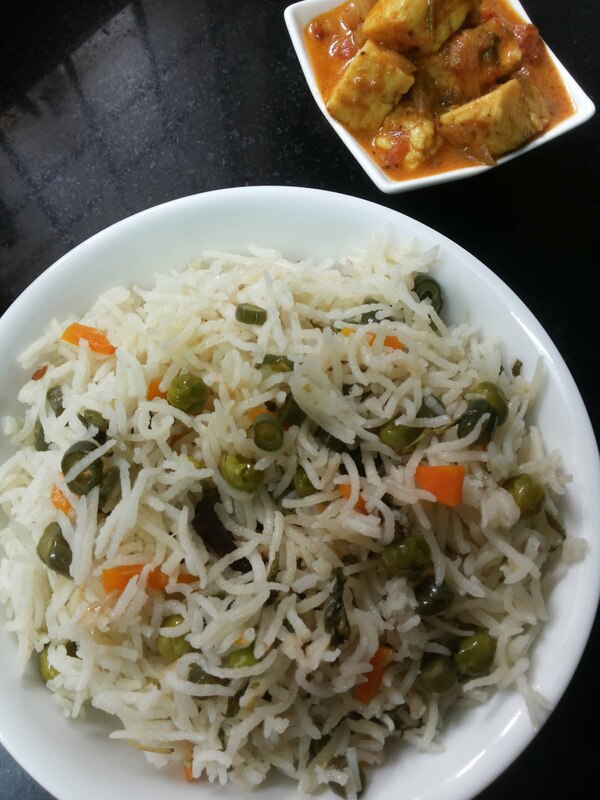 I love to cook and I enjoy every sound and smell which fills my kitchen when I cook. I learned a lot about cooking only after my marriage. 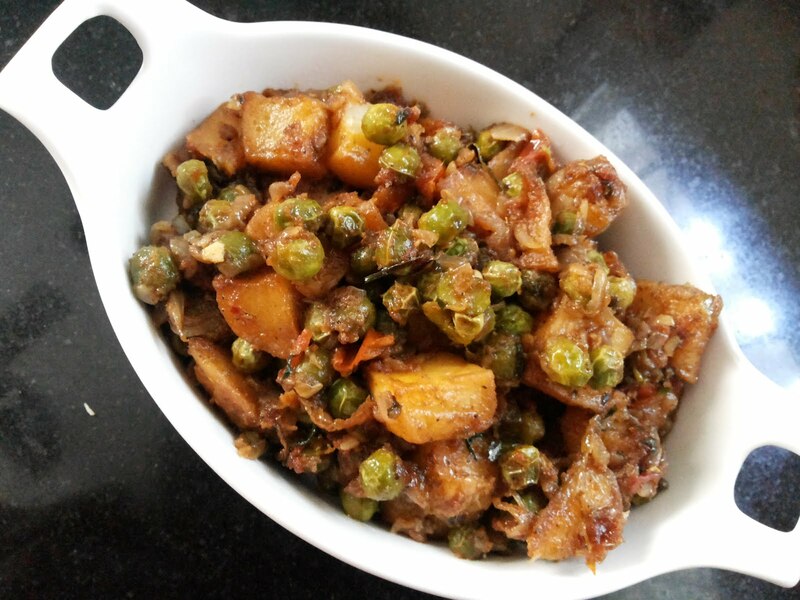 The recipes which im sharing in this blog are those which i learnt from my mother, aunty, friends, good neighbours and cookbooks. I believe in keeping cooking easy and simple. Here in this blog I will be sharing about how eating praying and cooking makes me one happy homemaker! Thought for Healthy Life. . .